Want to understand more about turntables and phono cartridges? Our Turntable Basics will get you there quickly. How to set up and use a Music Server that can hold your entire music collection. Audeze, famous for their planar magnetic drive headphone designs, has introduced four new models, the LCDi4 in-ear model at $2495, the LCDMX4 at $2995, the LCD4Z at $3995, and the LCD2 Closed Back at $899. 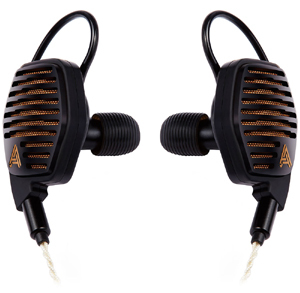 Audeze's goal when designing the LCDi4 was to create the absolutely best-sounding in-ear experience. They took their award-winning LCD4 design and scaled it down to create an in-ear headphone that is far more portable. This model's single-driver construction is designed to give the user a truly wide and accurate soundstage, superior transient response, and bass response flat down to 5Hz, all in a package that weighs less than half an ounce per side. The LCDi4 uses the same ultra-thin diaphragm and patented drive technologies as the flagship LCD4. This results in a distortion level of less than 0.1%, even at high volumes, an amazing achievement for in-ear headphones. The headphones come with a new magnesium top housing for light weight and premium, braided cable made of silver-plated OCC copper with Kevlar threads for additional strength. A perfect combination of the LCDX and LCD4, the LCD-MX4 has the easy-to-drive diaphragm and voice coil of the LCDX combined with the extreme magnetic force of the LCD4. It features a different soundstage presentation from the LCDX or LCD4 to help simulate the sound one experiences in a room rather than under headphones. The lightweight design of the LCDMX4 headphones includes a durable magnesium housing with a carbon-fiber headband. Significantly lighter than the LCD4 model, the new MX4 is the choice for long mixing sessions and hours of critical listening. The LCD4z is the easy-to-drive Version of the flagship LCD4 and features a new look and greater efficiency. It features a dark, sleek aesthetic with gold accents. Engineered with a new strong and non-resonant magnesium housing that produces a light-weight, visually appealing headphone, the LCD4z still maintains the sound signature of the LCD4. To accomplish this, Audeze has taken the award-winning design of their top-of-the-line LCD4 and engineered it with a special 15 ohm voice-coil, making it significantly easier to drive than the original LCD4. 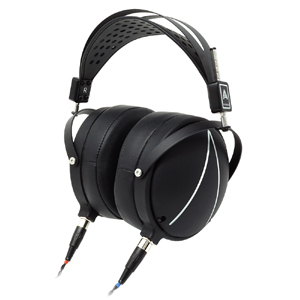 This model does not replace the original 200 ohm LCD4 but offers a perfect solution for users seeking more head room. 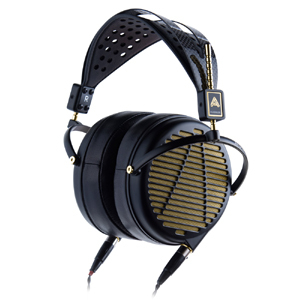 Audeze's first model was the LCD2, back in 2009. Building on its classic sound, the LCD2 Closed-Back headphone offers the pure, authentic listening experience of their planar magnetic headphones but with increased isolation and greatly reduced ambient noise. This results in a private, powerful, and immersive experience. The LCD2 Closed-Back has a sleek, modern design, superb dynamics, and ultra-low distortion. Its deep and controlled bass is intensely powerful, yet amazingly accurate and delicate when appropriate. The LCD2 Closed-Back headphone comes with a lightweight suspension headband, special crystal-infused nylon rings, and contoured memory foam ear pads for enhanced comfort. Audio-Video Furniture, Cables, CD Players, Digital-to-Analog Converters (DACs) iPod Docks, DVD and Blu-ray Players, Headphones and Headphone Amplifiers, Integrated Amplifiers, Loudspeakers, Phono Cartridges, Power Amplifiers, Power Line Conditioners, Preamplifiers and Processors, Receivers, Tuners, Turntables, Tonearms, and Record Cleaning Machines, Video Displays and Screens, and more. Reach the store quickly and easily with our directions from New Jersey, New York, & Pennsylvania. Copyright © 1990 - 2019 Audio Nexus, LLC. All rights reserved.